The Second Battle of El Alamein, frequently cited as the turning point of the war in North Africa, began 70 years ago today. Whilst at the time it was no doubt a great morale boost for a victory-bereft British public, who had only seen defeat since 1939. History would suggest however that the Second World War was, for the most part, won and lost on the Eastern Front, given the vastly larger number of troops in action in that theatre. 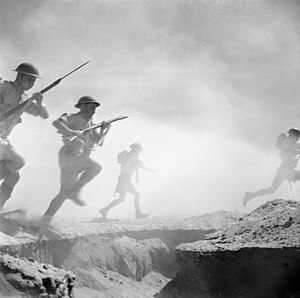 Given the perilous state of the country’s armed forces between 1940 and 1942, and given that for a large part of that time Britain was standing alone, a limited campaign in North Africa was probably all that the Army was capable of fighting at the time. Alamein did once and for all prevent the Germans from breaking through to the Suez Canal, and the oilfields of the Middle East. My Grandad was in Iraq at the time, but ‘missed out’ on Alamein. Of course, it could said that the Battle of Alam Halfa earlier in 1942 probably ended Rommel’s last chance of winning the war in North Africa. However, Alamein did also mark the rise of Montgomery in public consciousness as a senior commander who won battles. On the subject of El Alamein, the guys at Philosophy Football have released a special El Alamein 70th anniversary t-shirt, with a Desert Rat artwork and in a nice sandy colour. Check out Philosophy Football’s website here. As a football fan, historian and sometime-philosopher (normally after a few pints! ), I’ve found these t-shirts form Philosophy Football pretty cool. They’ve recently released a range of t-shirts to mark the 70th anniversary of the battle of Stalingrad – possibly the most pivotal event in the Second World War. Incorporating much of the familiar soviet art work and styling – which, I have to say, I find rather cool – one nice t-shirt in particular features the slogan ‘nobody is forgotten. Nothing is forgotten!’ in Russian script.